Holo holo in Hawaiian means to get around. And that’s what the filmmakers do, holo holo you to many of the ranches across 5 islands. 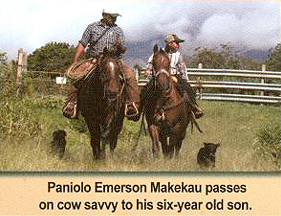 The Hawaiian cowboys inherited a rich history, originating with the vaqueros of Alta California, when it was still part of Mexico. The vaqueros were held in such high regard that in 1833, King Kamehameha sent for three of them to teach his people how to rope and ride and catch the wild cattle. This task was not for the faint of heart. The wild cattle that inhabited the volcanic slopes of Mauna Loa and Mauna Kea, were chased down (sometimes in the dead of night), roped and tied to trees. 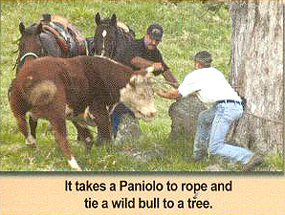 The next morning, the paniolo would untie the snorting bull, snub him to his saddle horn and “lead him” down the mountain. Needless to say, it demanded great horsemanship and uncommon bravery. This courage under fire is the birthright of the paniolo and prevails to this day. 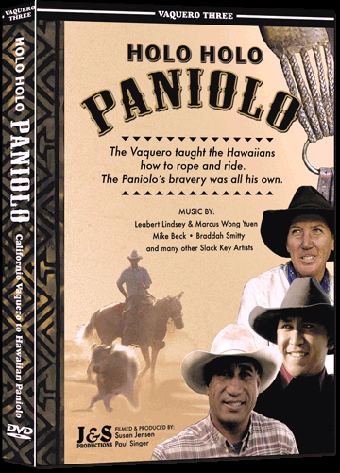 The tradition was carried to Hawaii 1833 where the cowboys soon became known as Paniolos. The Hawaiian don’t have S in the alphabet so instead of Espaniolos they called themselves Paniolos. The Vaquero taught the Hwaiians how to rope and ride. The Paniolo's bravery was all his own. Here they had to adapt the skills and equipment to the environment of Hawaii. The Hawaiian saddle, the brass honda, the Hawaiian loop for branding all are unique to the islands. And of course they are famous for their slack key guitar. Highlighting the story is the music. 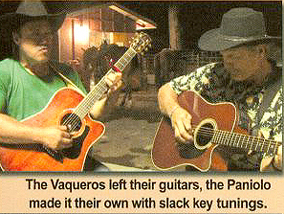 From the vaqueros’ Spanish guitars, the paniolo created the slack key guitar style. The melodic, silky strains are interwoven throughout this enriching, sometimes amusing, and very engaging film. 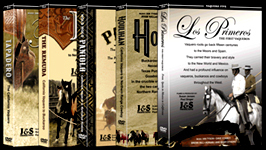 This 90 minute documentary has just been released and is taking the Vaquero horsemen community by storm. picks up where Tapadero leaves off, and takes you to the land of the Buckaroo, the Great Basin Country of Nevada and Oregon. You’ll get an insider’s look at famous ranches, like the White Horse in the Owyhee Desert of Oregon and the TS in Battle Mountain, NV. You’ll watch as they wrangle in their big cavvys, and expertly rope out their horses for the buckaroos to go to work. You’ll see them branding on the open range, using skills passed down by their Californio forebears. The story of the Californio Vaquero and how he became one of the world’s greatest horsemen. It uncovers the secrets of the spade bit horse and rawhide reata, and introduces you to the mainstays of vaquero horsemanship, past and present.